I remember many a Sunday night as a kid, sitting on the living room floor with a bowl of popcorn with my several siblings, tuned in to NBC to watch “The Wonderful World of Disney.” It came on right after Mutual of Omaha’s “Wild Kingdom,” an amazing show where host Marlin Perkins would stand safely on the shore of some African river and describe the dangers co-host Jim Fowler was facing as he waded through crocodile-infested waters to wrestle a hippo or something. Disney was no stranger to telling tales about wild animals, either, and lightweight documentaries about a variety of animals were a mainstay of Sunday night programming. This was easy to do, because the Disney vaults were full of them. Over the years, Disneynature has continued to create an impressive amount of wildlife documentaries, although many of them have had greater success on DVD than in the theater. Theater or DVD or Blu-ray, their latest offering, Chimpanzee, is not to be missed. Tim Allen, beyond his success on television and in movies, has carved out a rather successful niche in doing voice-over work, and not just the Toy Story franchise where he voiced Buzz Lightyear. You’ve probably heard him on TV commercials for Chevrolet, the state of Michigan, and Campbell’s soup. Allen narrates Chimpanzee with his unique blend of hominess and humor that adds both warmth and insight while educating and entertaining us. Three years in the making in the Tai Forest of the Ivory Coast, Chimpanzee is a true-life adventure that follows an adorable young chimp named Oscar as he learns about life in his corner of the world. For many years, human beings mistakenly believed that one thing that distinguished them from the rest of the animal kingdom was their ability to make and use tools. Ten minutes into this film, you witness just how false that assumption is. These clever chimps have figured out how to use wooden logs and stones as hammers to crack open a variety of nuts, a significant part of their diet. This skill is passed down generation to generation, mothers teaching their infant children by example. We’re not talking about peanuts or pistachios here; we’re talking about big, baseball-size nuts with really hard shells, and the most skilled among them can crack and eat as many as 270 nuts in a day. The story is a remarkable and compelling look at a world few humans ever witness, where rival gangs of chimpanzees covet Oscar’s family’s land because of the wealth of nut groves, and they plot to take over the territory. Some of these other chimps are painted as the bad guys, and the tale that unfolds is fascinating, very funny, and a little frightening. But Oscar’s story, in particular, is a wondrous and wonderful tale of hope and courage and love. Anyone who doesn’t think animals are capable of such things should take a look at this film. I won’t elaborate on the trials and challenges young Oscar faces out there in the jungle, but we don’t use the expression, “It’s a jungle out there,” for no reason. The end credits offer a few behind-the-scenes looks at the dedicated crew of filmmakers who worked tirelessly for three thankless years in the jungles of Africa, schlepping cameras and gear for miles every day, on foot, to achieve some truly incredible footage. Unlike their counterparts in Hollywood who have the luxury of craft services and air conditioned trailers and actors who do what they are told, these documentarians survived on meager rations they prepared themselves, camping in the jungle, and working with actors who couldn’t care less about cooperating with their schedule. Chimpanzee is rated G, and I can’t imagine anyone not enjoying it unless they have already exhibited a predisposition toward hating puppies or ducklings or any other baby animals otherwise considered irresistibly cute. But it’s not all an ooh-aah fest, either. 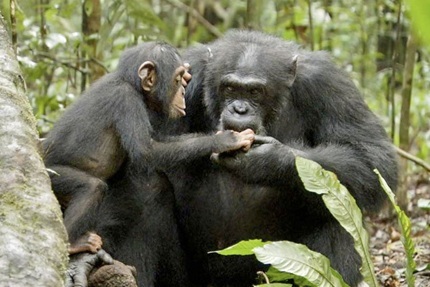 There are some startlingly serious issues shown in Chimpanzee, as conflict and death are part and parcel of the animal world just as they are our world. I think Walt Disney would be proud to have his name attached to something that still reminds us what a wonderful world this is.